Mike Peery has more than 35 years of technical and managerial experience in the development of software products for computational fluid dynamics (CFD) analysis and scientific/engineering data visualization. He holds a Bachelor of Mechanical Engineering degree from Oregon State University, as well as a Master’s degree and Engineer’s degree in Mechanical Engineering from Stanford University. He holds the position of chairman at Tecplot, the CFD visualization software company he co-founded in 1981. Q1: What do you see are the biggest challenges facing CFD in the next 3 years? Mike: The “democratization” of CFD or in other words the increase in application of CFD software (from grid generation, solver, post processing) by non-CFD-experts. I actually don’t like the word “democratization”. John: Would despecialization be better than democratization? Mike: Despecialization makes more sense to me, but the word thrown around the industry right now is “democratization”. So let’s stick with “democratization” and understand that it isn’t a political system, but it really means CFD used by more people (proliferation) who are not experts (despecialization). “Democratization” denotes the idea of power to the people and for CAE it suggests putting more capabilities in the hands of the generalist engineer. More CFD computing is being done (because of the ever-decreasing cost of CFD computing, the increasing demand for CFD results in modern design processes, and the improving performance and usability of CFD tools) and therefore managing the CFD results has become a problem. Yesterday the results from a CFD study were a couple of numbers, today they are a large set of numbers – like an entire aerodatabase describing the forces and moments on an aircraft over a range of operating conditions. It is a challenge to quickly analyze and interpret these results to make better engineering design decisions. Therefore, developing a process for CAE simulation needs to become part of the overall design process. The process of design has been studied and defined over the years, but the process of CAE simulations has had little attention. As democratization takes hold, engineers will need to have better defined processes for conducting CAE simulation studies. Q2: So how does this all pertain to what you’re currently working on? Mike: Tecplot (and I) have been focused on CFD Simulation Analytics. Simulation Analytics refers to the tools and processes that help engineers manage and distill the information from the vast numbers of simulations into a content-rich set of information they can use to make decisions and retain for future use; and to explore, discover, and quantify interesting features and anomalies to gain understanding. We launched a new product at the end of 2011 called Tecplot Chorus. 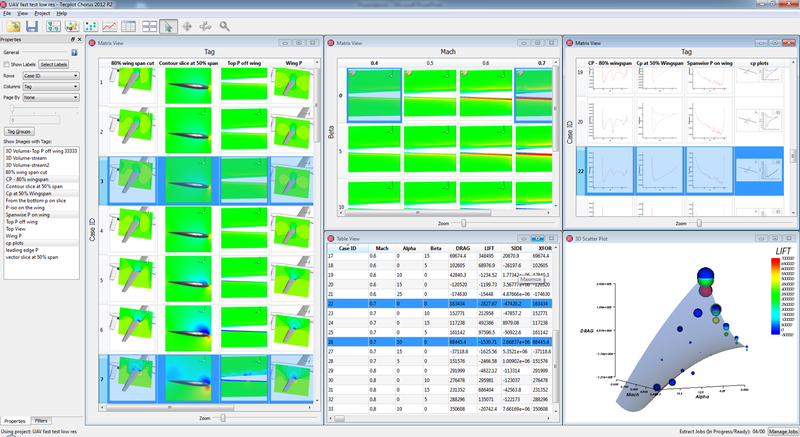 Chorus is the first CFD simulation analytics tool. We have a large group of companies in our customer advisory council representing many of the large organizations in aerospace that are guiding the development of Chorus. Of course we have ongoing development of several related products: Tecplot RS, Tecplot 360. Tecplot Chorus, the first entrant in the nascent field of simulation analytics. John: So what’s it like to create an entirely new software category? Do you get tired of explaining what simulation analytics is? Q3: What path did you take in your career to get to the point where you’re defining simulation analytics? Mike: I have always excelled at mathematics, science, and problem solving, so engineering was a natural for me. I have three degrees in mechanical engineering (B.S., M.S., Engineer) with a focus on fluid mechanics and thermodynamics. Graduate school was so much fun, because I love to learn. After grad school I analyzed the fluid and thermal dynamics of nuclear reactors at Idaho National Engineering Laboratory before joining The Boeing Company to support the 747 program. My father (and grandfather) also had a major impact on my aspirations. They were both entrepreneurs and ran small businesses as well as were involved in starting other ventures, so it was ingrained in my brain to eventually have a business of my own. In 1981, I co-founded Tecplot (which was originally known as Amtec Engineering) and started developing the Tecplot software. John: This raises an interesting question. Do you think engineers are well-suited for entrepreneurship? I’ve heard it said that it’s easier for a tech person to learn the business stuff than it is for a business person to learn the tech stuff. Mike: I absolutely agree with you that engineers are well-suited for entrepreneurship. I don’t believe all engineers would make good entrepreneurs, however. I think it takes someone that can dream of something that doesn’t exist and has a belief that it can be created even though it is not clear or certain on how to do it. If an engineer has a “vision” as well as the technical know-how and problem-solving skills, he or she could be an entrepreneur. I don’t think you have to start your own company to be successful; an entrepreneurial engineer can be very successful in large companies. Q4: You mentioned being inspired by your father and grandfather. Were there any other influences on your career? Mike: In my first job at Idaho National Engineering Lab I delved into my first really significant experience with CFD where I wrote my first computer code to simulate two-phase flow in a pipe network. I loved this because it added computer programming and numerical analysis to the math and science I already had. It was all magic to me. To think that a computer could model the flow of a fluid over a complex geometry just blew me away – actually it still does. I was looking for an opportunity to do CFD in a business of my own. I did some consulting work by myself and found it very satisfying. Eventually I had enough confidence in myself to step away from my regular job and start a company where I could do CFD. I was fortunate to have a colleague and friend, Don Roberts, who ventured out with me and we launched Amtec Engineering. My inspiration was to have freedom to choose my own projects, create great products that receive great customer feedback, make a positive difference in the world, and to “play” with CFD and actually get paid for it. Q5: From your experiences along the way, what advice do you have for young people entering the field today? Mike: Find the work opportunity that allows you to do what you love most to do and that can support you and your family. Choose your career mostly for what brings you happiness and satisfaction, and less on how much money you can make. Balancing work, family, community, and personal needs, is dynamic not static. Sometimes you need to get the job done at work, yet sometimes you have to let go of work and get the job done at home. I think it is essential to periodically take time to review how your life is going and what you want to do with the rest of your life, to make sure you are on the right path. Don’t be afraid of risks; especially early in your career. I don’t mean just a risk in starting your own business, but a risk in selecting a job, trying for a position that you are not experienced at, or trying something in which you might fail. Find out what you really like to do, and pursue it. Always focus on getting results for your ‘customer’. Q6: How do you know Pointwise? Mike: What?? Who doesn’t know Pointwise? In fact I first heard about Gridgen/Pointwise when they gave presentations at the Air Force on grid generation. This was a long, long time ago. John: I’ll say. How come I don’t remember meeting you back then? Were you a lurker? Mike: Oh my gosh! A lurker? I just may have been. I am an introvert, so I don’t necessarily leave a memorable presence. Also, back then we had our heads down writing CFD and Viz codes, and didn’t venture out a lot. Q7: Can you share with us your favorite tools and resources that help you get your job done? Mike: Talking with customers and industry colleagues is critical. I go to several conferences: AIAA Aerospace Sciences, Joint Propulsion, and a number of others. I was involved for many years in an ASME technical committee on propulsion in the Aerospace Division that brought me in contact with a number of industry people. John: Another Python fan, eh? Folks would like us to add a Python binding to our Glyph scripting language. What do you like about Python versus Tcl? Mike: Python is marvelous. A compact syntax, fully object oriented, with a strong development team behind it. I am not very familiar with Tcl, so I can’t really compare. I know that Python is the most popular scripting language used by our customers today. Q8: If we were to come visit you, where’s a good place to go out for dinner? Mike: Peery’s B&B (and for you, BBL&D, Bed, Breakfast, Lunch and Dinner). John: I can vouch for the fact that the coffee’s excellent – best latte I ever had. But be careful that the word doesn’t get out or you’ll have a line around the block. Mike: John, one of the best parts of starting a small business is getting to know other entrepreneurs like you. Also, it has been a pleasure to get to know the good people at Pointwise, who share the same values as the people at Tecplot. This entry was posted in People & Places and tagged Tecplot. Bookmark the permalink. These Q&A articules are very interesting. Hope they are more of these…. by the way, I use more TCL (for scripting hypermesh), I have just played with python. Cesar, you’ll be glad to know we have 3 interviews in-work currently and hope to publish them soon.